XRL is a lighter version of X-RHex, designed to be more agile while maintaining the same leg spacing as RHex, and features the same modular payload architecture to support a variety of research needs. X-RHex Lite (XRL) is a design study in methods of utilizing the same laboratory on legs components as X-RHex, in a slightly different configuration to simplify fabrication, while minimizing weight. XRL is designed with near identical spatial dimensions as Research RHex, but is constructed via an interlocking design of flat aluminum pieces, all machined using a waterjet cutter, rather than CNC milling. 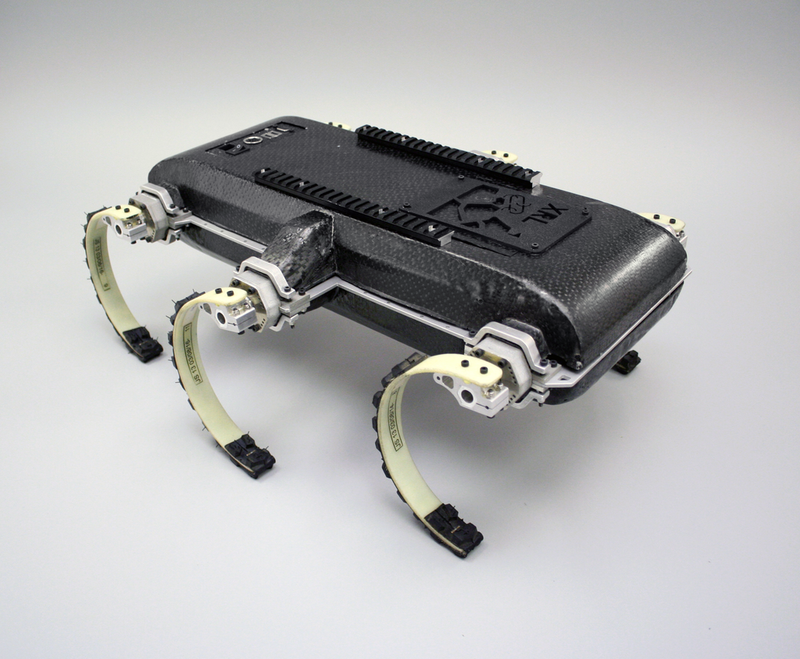 Surrounding the robot’s frame is a complete shell of carbon fiber (similar to “Shelly-RHex” variant), serving both as a protective shell as well as a structural member, particularly for stiffening loads upon the cantilevered leg mounts. XRL, as a lighter weight cousin of X-RHex, uses only a single battery compartment, provides space for the same PC/104 control computer, and utilizes three electronics stacks (each controlling two motors), spaced evenly throughout the body, all mounted on the waterjet cut frame. Through the use of a USB bus as the common communication method within the robot, these changes in electronics are easily performed across robots. Additionally, XRL employs the same payload architecture as X-RHex, providing Picatinny rails to mount sensors and other payloads, with a variety of ports to both power and communicate (via USB) with payload systems.